Dix Bruce is a musician, writer, and 'journeyman mandolinist with a strong belief in teaching a wide range of material, from bluegrass and jazz standards to classics, waltzes, polkas, and other ethnic music. The choice of material in this 5 1/2' by 8' QWUKGUIDE reflects that philosophy. 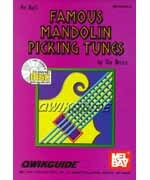 This book is not meant to be mandolin method but a collection of fun tunes to play. The selections in this book are in no particular order, although the easier tunes are grouped toward the front. Performance tips are given at the front of the book for each tune. All the tunes are in notation and tablature. The accompanying CD is set up so that you can play along with each tune at both regular and slow speeds. You can also adjust the balance control on your stereo to hear both mandolin lead and accompaniment, just mandolin lead, or just accompaniment.